According to my mother, a successful and busy real estate agent for 28 years who has looked in thousands of closets, my husband and I are an anomaly: he has far, far more clothes than I do. He’s not a clothes horse; he’s gentle with his clothes (unlike me, I’m sorry to say), so they last and last. He wears a standard American working guy wardrobe: khakis, Dockers, button down shirts, polos, and t-shirts on Friday and the weekends. He gets a couple new dress shirts a year and a ridiculous number of new t-shirts (his work, conferences, and other people’s vacations [never our own]), so the clothes really build up. When I began decluttering, he had 100 t-shirts and a generous number of shirts for work. I got him to give up six t-shirts at once. Then my daughter got 10 out of him for a project. I was sure that he could do with even less, started Operation No Brainer. I turned all the hangers in his closet around the wrong way, and then I waited. Where we live, we pretty much only have two seasons: cool and various degrees of hot. I waited through the end of the hot season and the whole cool season before I went back into his closet. Not surprisingly, the clothes that were turned around had been moved to the outside. We looked at them together and turned three around: a red shirt that he wears once a year to church on Pentecost, and two concert t-shirts from his younger days. There were only ten things to take out! I have to say, I was surprised by how much of his wardrobe he wore. I was also surprised at how much of his wardrobe had disappeared because of this exercise, not at the end, but along the way. Having the hangers backwards made him more aware of what was in his closet. Some of the things he decided to unload before the end. Was it worth it? Absolutely! I learned that most of Dan’s clothes are in rotation. Dan liked the ease of not having to make any real decisions, and he didn’t have to defend himself against me trying to get rid of things he wanted to keep. Almost imperceptibly, his t-shirt wardrobe decreased by about 40 shirts and his dress shirts by about a dozen. We also eliminated a number of pairs of pants that no longer fit. (One was visibly dusty where it folded over the hanger!) Without a doubt, this was the easiest decluttering ever… you might even call it a No-Brainer! This box of tarot cards was another item decluttered from Liam’s room. 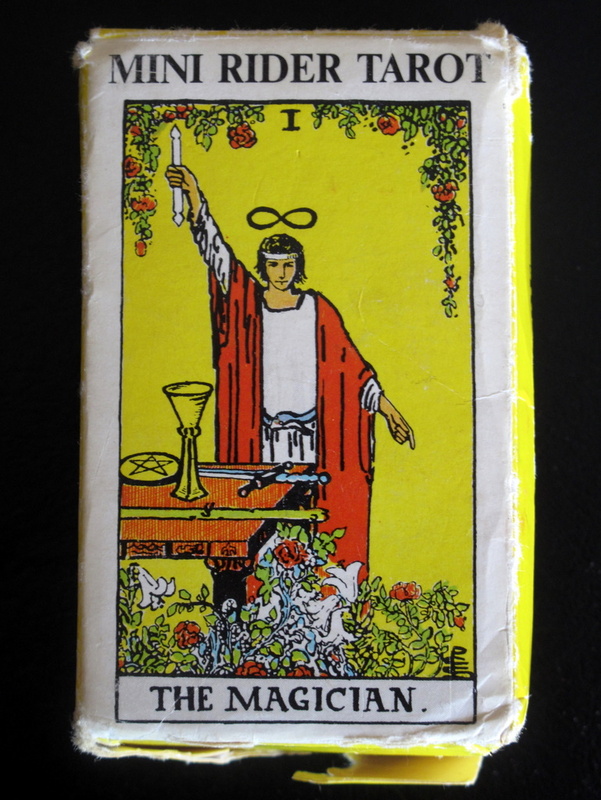 Maybe he decided that he had a better chance of becoming an artist than a fortune teller. My baby (19 year old Liam) went off to his first day of his second year of university today – It kind of felt like driving him to his first day of school when he was little because four months ago we had our doubts he would ever come home never mind be back at university so soon. I think we will celebrate with donuts at the mall after I pick him up. Catching a fleeting glimpse of something out of the corner of my eye and having a giggle about what I thought it looked like – Needless to say there was not a kiwi bird on the footpath in Australia. Discovering the nectarines taste almost as good as figs do when you heat them up in the microwave with honey and they eat them with a dollop of thickened cream. I agree, this is a very easy method of decluttering. I wonder if it is men called Dan?! My DH is too and he also has more clothes than me. He keeps his t-shirts folded and rotates clean ones to the bottom of the pile each time. In fact he has 2 piles and I never know which is which, so t-shirts are the only items in his wardrobe that I don’t put away when doing the clean laundry. But I did find a whole pile of them in my charity box the other day 🙂 so he’s obviously taken on board the things I’ve been trying to do. He did however throw out one that was originally bought for me (I’ve lost 28lbs recently) that i rescued. I don’t know if I can wear it again but it has a fantastic aboriginal pattern so I may be able to turn it into a cushion cover or something. good for you loosing 28lbs I bet you feel better for that decluttering effort. My hubby is loosing weight too at the moment and he feels and looks better for it. Back to the subject at hand the men with more clothing than women phenomenon is not limited to Dans my hubby Steve also has more clothes that me. This is mostly due to military uniforms though. He decluttered his wardrobe last year which also reduced the amount of ironing that is generated. I love those new wicking fabrics that they make these days that are cool to wear but don’t need ironing. I hope his weight loss doesn’t cause him to have to go out and buy more clothes though. No, it must be Dans and Steves: my hubby is Steve and he has more clothes than me. I am starting to think it is just husbands in general and that is it just a coincident that we have a lot of dans and Steves among us. Cindy, I think this is such a good way to declutter a closet. So many times we have favorites and we don’t realize how there are things we never wear. My closet is pretty sparse compared to most women or men. My Mom’s is another story. I SO wish I could get her to do this. She has the “I might be able to wear them again” syndrome. Grin. Colleen, it’s so good to know that Laim is doing so well. What a great answer to prayer. my mother is a very good dressmaker and she has clothes in three wardrobes throughout her house. Lucky for me she doesn’t live with me like your mum does. Thank you, Liam is doing so well and I must admit I did shed a tear when I wrote that gratitude item yesterday (now I am welling up again). The outcome could have been a whole lot worse. So glad Liam has come so far, Colleen. A brush with tragedy makes a person extra grateful for normal life. it has made us grateful but he just thinks he’s invincible. By the time he could remember from one day to the next most of his other injuries and the affects fo the brain injury had healed so he will never understand what all the fuss was about. His sister likes to remind him though and does the big sister lectures when he gets to full of himself. Cindy, great ideas here. Can you tell us what your daughter’s project with the ten t-shirts was? Clara wasn’t collecting t-shirts for herself. The PE teacher at her school was sponsoring a drive for Open Arms http://www.theopenarmsshop.com/, a nonprofit that employees refugee women to turn t-shirts into other useable goods. It’s funny but sad too! What is it with men and tee-shirts. 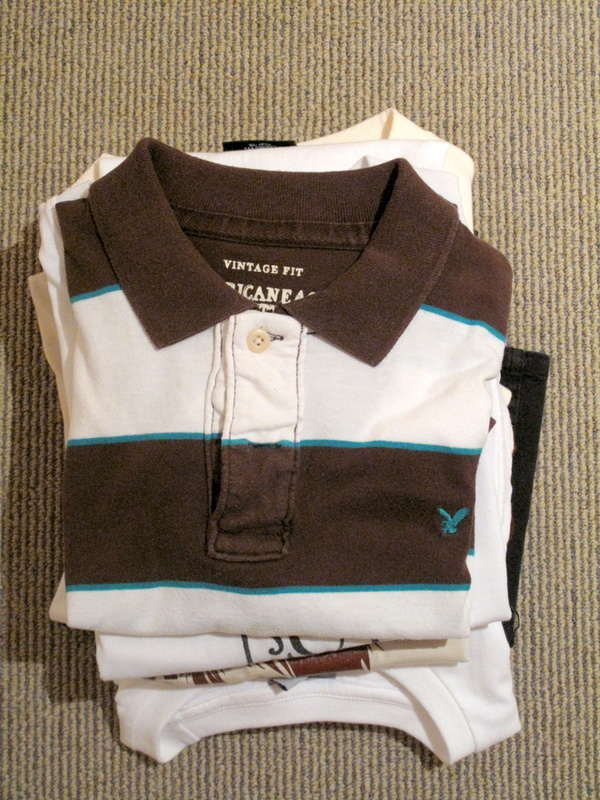 My OH isn’t called Dan, lol, but has 4 times the number of clothes than me and loads of tee-shirts. His clothes are due to hording and living in various differnt places and starting over each time while putting his current stuff into storage with family. This last 6 weeks he has finally brought it all here under one roof. To his great credit, he has finally faced up to it all and he has gone through 15 binbags of the stuff and got rid of a lot…but the teeshirts to commemorate every place or event he has ever been to are legion! One thing he is particularly brilliant at is folding clothes (and towels and bedding), so the ‘4 times more than he needs’ that he has kept (10 bags to charity shops) are now beautifully folded on top of our storage in the bedroom. I am happy wiht this: it is now no longer hidden away out of sight ,out of mind. So he will either use the stuff over the next year or two, or gradually get rid of more of the surplus, now he has discovered the world doesn’t come to an end if you declutter and get rid of stuff you don’t need. We don’t have doors on our clothes or shoe storage – mainly because there isn’t room for them and partly becasue our storage is a (most excellent) hodgepotch of doorless furniture found on the streets and we have also made use of alcoves to put up rails. It works for us, because I find particularly my OH needs to see stuff to use it. I really like the idea of turning the hangers round Cindy to see what gets used. Colleen – that’s great news about your son. I bet your gratitude knows no bounds. I am glad your OH is open to the idea of getting rid of the excess and things are starting to come together in your home. You must be a good influence on him. As you say my gratitude knows no bounds both to God and the good people who prayed and sent their well wishes to him while he was injured. I often find myself thinking back to those days and the emotion it evokes is very strong. Wow! That’s a lot of t-shirts. Good for you for helping him pare down. You know the t-shirt that I don’t understand: ones from other people’s vacation. Why? Why? Military uniforms take on a life of their own. Ask my military son (named Dan) and son-in-law, both of whom have waaaay more clothes than their wives. It goes with the job. At this point, my husband (not named Dan) has more clothes than I do, but I did/am participating in Project 333 so my clothes ar at a minimum right now. Cindy and Nurchimiel, your posts have inspired me to clean my closet today! Everything is out of mine and I’ll be dusting and vacuuming in there this afternoon. Yeah Willow. Hope it’s a success closet-clearing day. the name Dan is just poppin’ up all over the place today. Yes those military uniforms are an issue, Steve has Camouflage gear (Cams), Dress clothes (Blues), Mess kit for special occasions, Flying suits, and jackets, socks, boots, belts, ties and rank slides to go with some or all of them. Not to mention duffle bags to carry them when they go on deployment and all the other bits and pieces required in that situation. Boy, will we have some fun decluttering when he retires. MMM I like the sound of that. Good luck with the closet cleaning. I did Liam’s recently and was shocked at the amount of dust that had built up in there. I tend to eat fruits as they are, well, except for strawberries which my boys love dipped in dark chocolate. But you’ve just inspired me to try your nectarine recipe! Sounds like a yummy treat! by the way I loved your post the other day on Excellence-beauty-and-reality-what-gives . That’s interesting. I had just thought I was weird because I can never find stuff in my wardrobe that I haven’t worn in twelve months: it’s there so I wear it. Instead now, I’m trying to buy less clothes to start with to keep my wardrobe less cluttered. 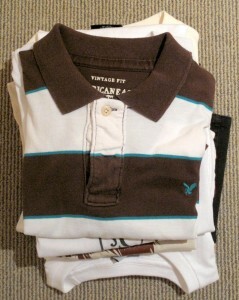 I have joined a challenge to not buy more than 12 items of clothing in 2011 on a blog called The Really Good Life. I am actually challenging myself to buy no clothes in 2011 but unfortunately some of my T-shirts are developing tiny holes in the front. There is something causing this and I suspect they are catching on something sharp on the fly of one of my pairs of capris. I am doing a slow investigation on that. I am hoping it won’t sabotage my efforts. When I was thinking about this yesterday it occurred to that I haven’t bought any clothes since August last year. it is nice to know that I am not the only one. I am on the search now to figure out which pair of pants are doing the damage. I have a strategy to help narrow this down. The shirts that are affected all seem to have lots of red in them so the pair of pants must be one that goes with red shirts. That probably doesn’t narrow it down much but I was pleased with my detective skills anyway. 😆 Do you find that it is mostly tighter fitting shirts that have this issue?